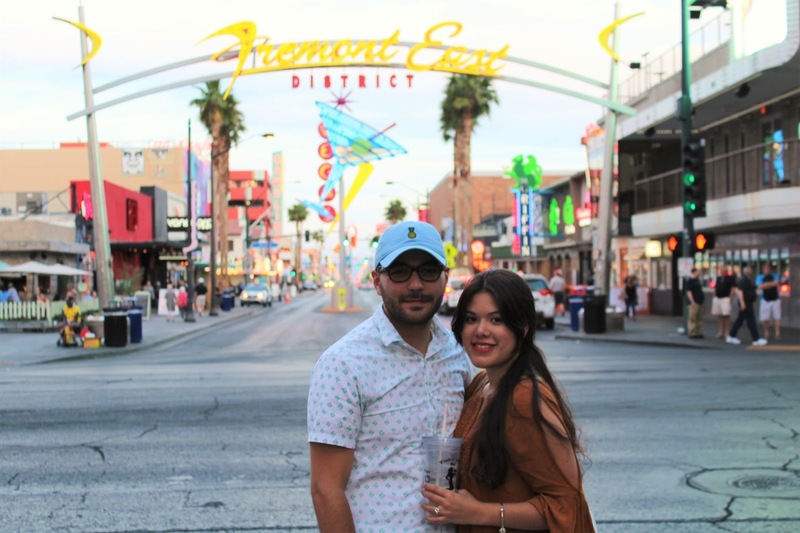 After the Seven Magic Mountains we went to old Vegas more known as Fremont Street. Here we walked straight to the street to know the old area that was cover completely of light, bars, hotels, restaurant, souvenir stores, people with crazy and funny costumes, dancing, doing magic and other crazy thing to entertain people. It was really really fun, everything is cheaper and you can enjoy free concerts, shows and games. In other words these area is really nice to have fun. The fourth day we went to the Red Rock Canyon and let me tell you that was our favorite part of the trip. When you get there, there is a place like a museum and a little souvenir store. From there you can enjoy the beautiful view of the mountains and the desert. As I said before the view was incredible and the most wonderful thing was breathe pure air. That day the weather was perfect so we decided to get close to big rock to walk and of course take more picture!!! After the walk and picture we drove around the rock which took us like an hour to get out and we recovered that you can do different kind of thing over there. You can go on a hike, make picnics, climb, and more fun thing. We wish could stay longer to enjoy one of those things but sadly that was our last day in Vegas. However we enjoy a lot and have in our memories an amazing day together. Last thing we did before go to the airport was visit the Hoover Dam. Is something that you can miss if you go to Vegas to visit the tourist places. It has also a nice view in both side and you will have a little trip in Arizona before get there. What am I talking about? well our GPS show us that there is a new route to get there which make you drive till Arizona to make a u-turn to get back to Nevada. Crazy but was real and we felt lost in Arizona for 5 minutes lol. It was a nice experience that make us laugh a lot. Thank you for visit my blog and hope you like the post! xoxo!